adds 2 extra shelves. To fit WxD 1050x325 mm. 10 year guarantee and free delivery! Promote a more flexible working environment, by moving your cabinet to where it is most needed. Giving you the option to position your cabinet off the ground for easy access to contents. Four strong 100mm steel swivel wheels with rubber tyres give extra mobility, each with brake. Two additional shelves are created by adding the rack. Supports easy cleaning, by giving your cabinet mobility. 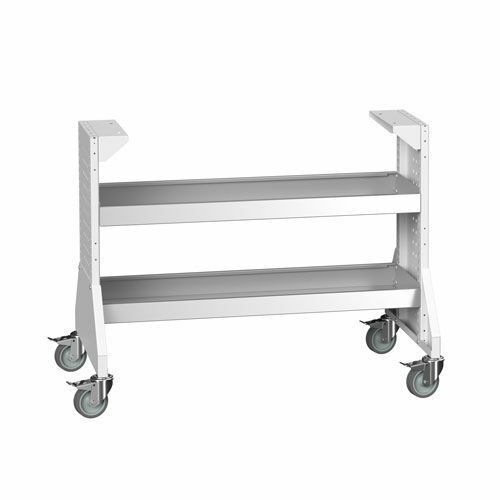 Strong steel movable rack for raising Bott Cubio cupboards and moving them easily.